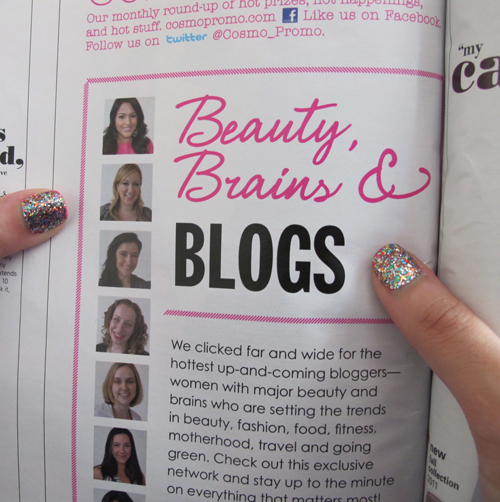 Beauty and the Feast top blog in Cosmo’s September 2011 issue! I have been reeling with excitement to tell you all that Beauty and the Feast has been chosen to be among the 11 sites hand-picked by Cosmo’s publishing team, naming us among the most influential up-and-coming bloggers in their September issue (on stands now). I’m SO honored! I remember when I first started as a little intern at Hearst seeking out the Editor-in-Chief of Cosmo, Kate White, just for a glimpse (it was my version of celeb-stalking). I was reading all her books and just thought it was the coolest thing to know she was working in the same building. I even stopped another poor blonde lady thinking it was her (“I’ll take it as a compliment, but Kate’s much taller and blonder than me,” she said with a smile…she was a nice lady). It’s crazy to be in the magazine now and seeing her speak at events like the Practice Safe Sun one I went to recently. The Cosmo publishing team has been working tirelessly to make this happen, and I have to say they are the sweetest, most down-to-earth, and hard working group of people. It truly has been so much fun getting to know them and attending their events these past few months. Another wonderful part about the partnership is getting to know the fellow bloggers – they are truly gems and I’m really excited to continue working with them on all our group and individual projects. Check out their websites below! Finally, none of this could have happened without loyal readers like you all. This blog started out as just a way for me to write about the (girly) things I love, and in no way did I even think it would grow to gain the readers it has (or umm be featured in a magazine like Cosmo). I’ve enjoyed reading your comments, emails, and words of encouragement on Twitter, so thank you for that. Most of my inspiration comes from you. If you are new to the site, thanks for visiting! As you can probably tell from the title, this is pretty much a makeup and food blog. I just love to play with products (and I do play with many), EAT like a monster, and write about it. I’m looking forward to hearing your feedback. I also have some great contributors who share that passion. To learn more about the site, please visit my ABOUT page. If you have any questions, please feel free to email me. AND don’t forget to pick up the September issue of Cosmo with Dianna Agron on the cover (available now) to check out the page, or visit CosmoPromo.com to learn more about the other websites. 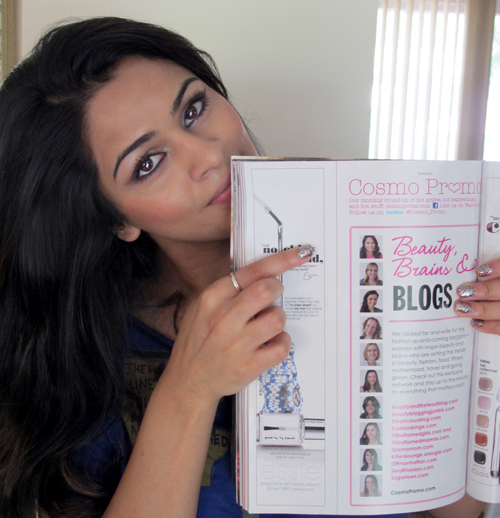 Pingback: Beauty and the Feast top blog in Cosmo's September 2011 issue! | Free beauty tips: hair care, skin care, makeup, lips, cosmetics, hairstyles, eyebrows, nails etc. You are my favorite beauty blog for sure! By the way, what nail polish are you wearing in those photos? I love it! So proud of you soul sista. Aww thank you guys so much!!! Shals, LOTS of love to you, you’re my rock. Haj, I actually did my makeup for another post before taking this pic..It’s a review on these new products that I’ll be posting! I’ll show you guys exactly what I used! look at you!! awesome work!